Photographer: Rayan Ayash. Model(s): Eva Doll. Source: Schön Magazine. 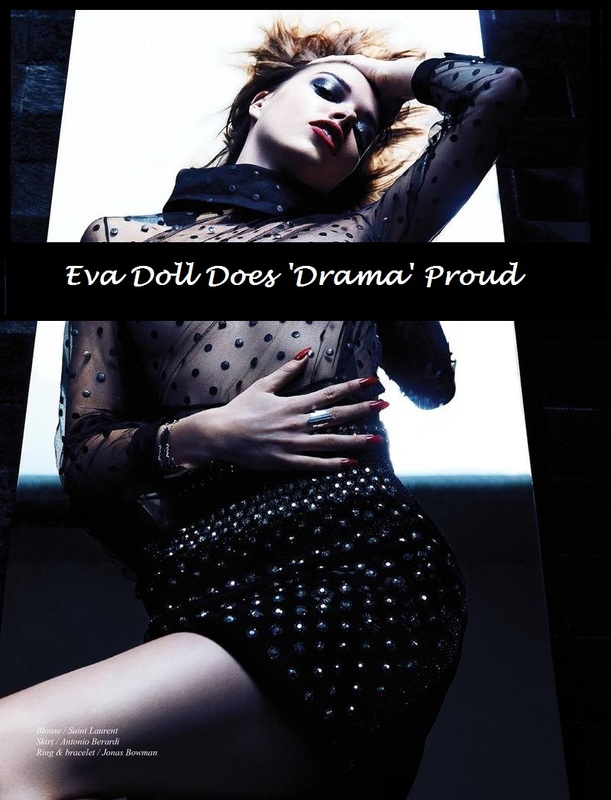 Eva Doll does ‘Drama’ proud in this sultry story shot by Rayan Ayash for Schön Magazine #25, Summer 2014. A publication after my own heart, Schön goes for bold with a trip down Summer’s lane. Evocative beauty born to run, to reach the epic points of pleasure we have to first be willing to leg go. Breaking free from the sun, Eva grabs a hold of the dark side, in this dramatic story daring us into another dimension. Femme-Fatale meets high fashion in this dangerous tale of love and other longings. Matt Bidgoli & Dustin Zuber, capture the essence of the evocative with noir looks by Emanuel Ungaro, Saint Laurent, Jean Paul Gaultier, Prada & more. Mastering the art of seduction, (Makeup Artist) Beau Nelson knows how to show it with modern makeup that keeps you coming back for more. Black winged-eyes encircled with a glittered glow, red marks the spot with hot lips that are ready to go. Hairstylist, Seiji, amps things up with straight hair that’s seething with seduction. Eva Doll plays the wild child in this exquisite editorial oozing with avant-garde innuendo.